wow i had this exact thing half typed into google when i was checking the HAD rss. wow, I was just at telit.com for the first time before checking my rss.. Weird. Oh well, how hard do all of you think it would be to use that module (since it has gps and sim card capabilities) for a high altitude glider? I really really want to make one and have been debating ways to communicate with it at 100k ft. Sorry if this comment is too irrelevant. I think Sparkfun had a GPS unit that had the phone and GPS in the same unit. The phone would also run Python Scripts, so I think that this could be done with one unit. Not as much fun as hacking it yourself, but faster. I think the price tag was at about $150 or so. in fact this IS the GPS-GSM unit with python script..
i guess he could do this without the board, but i haven’t figured out how..
it’s 126$ or so, which is quite cheap.. So, I know you can get prepaird GSM SIMs for things like this in Europeland.. but what’s an ‘merican to do? There seem to be a lot of GSM based projects out there now. We have good GSM here, so how can we do it here? #2, are you sure that cell phones work at 100k ft? I don’t know, but I doubt that they do – that’s 19 miles high. We used some long range (40 mile line of sight) packet radios from Freewave on a balloon launched UAV/glider I worked on. 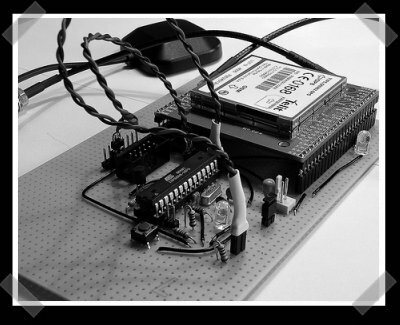 Dead simple to interface with – RS232 on both ends – and built in CRC/resend checking. As I recall though, they were quite expensive, but we were able to get them donated. I’m currently using an EM-406a GPS module from Sparkfun for a personal UAV project. It’s tiny, simple, and has a very sensitive integrated antenna. The unit picked up 5-8 satellites inside my apartment with a floor above me and other buildings around me. The position lock was dead on, but the altitude jumped all over the place. Hopefully that won’t be the case outdoors. #7: cell phones do not work above around 8000ft. completely useless for high altitude work. – no, but it has to come back down below 8000ft eventually. Also once it lands it is way more likely to be able to send info rather than a packet radio. I’m still contemplating the whole idea. So thanks for the help. Any suggestions or whatever email me AdamMelton@gmail.com so we dont clog this comment section anymore. Interesting. This could sure help with model rocketry. I wonder if it would be possible to include more data through the SMS, such as data from an altimeter or meteorological equipment. With enough work, you could even send pictures/video from an onboard camera to a cellphone through MMS. If I had a larger budget, I would look into this as a payload for a model rocket with a D-class engine or better. I have 5 gps tracking devices that were from a company that does Fleet Vehicle Tracking. these units have usefull components to do small project and it wont put that bad of a dent in your pocket. Im selling the Each unit for $100 bucks. i am looking for a cell phone that can be used to track human being anywhere they are. by sending sms to the number and it give the location where the person holding the phone is. As of now I’ll never hear a cell phone who can track the people where are they or what exact location are they. I am a student of BE(telecom). I am willing to make this project as my final year project. sir can you please guide me about the project and its working. Hey Samiuddin. If this topic was your final project, can you assist me as well. I would like to have it as my final project as well.